This post was actually written a couple of years ago about a side business I have called Cake-A-Bye Baby. 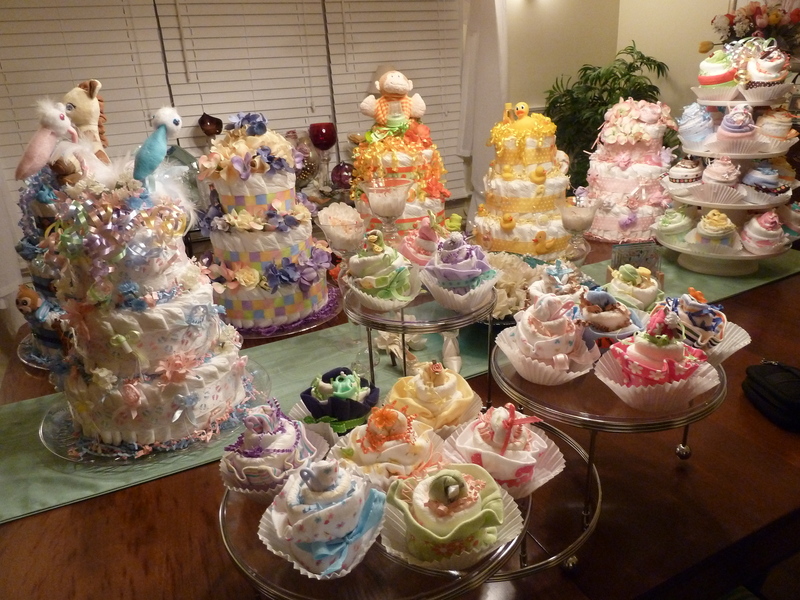 I make towel cakes and diaper cakes for bridal showers and baby showers. When I have the time, that is. I thought it appropriate to re-post it here, since I’m working on another diaper cake creation for my own daughter, and haven’t had as much time to write as I’d like. And anyone who knows me well know that I really don’t enjoy cooking – I have to be in the mood. Writing is much more fun. I do enjoy baking though, but usually only Christmas cookies. The whole month of December our house has the best smells – and containers of all kinds of tasty cookies piled all over the kitchen, waiting to be devoured by family and friends or packed up and given as gifts! You’ve seen some of those recipes! But secretly I’ve always wanted to learn the art of cake decorating. I’m always just so amazed at the beautiful cakes so many bakers turn out, seemingly on a daily basis. Pinterest can sometimes drive me crazy because I see all these fantastic sugar creations that other people have made. 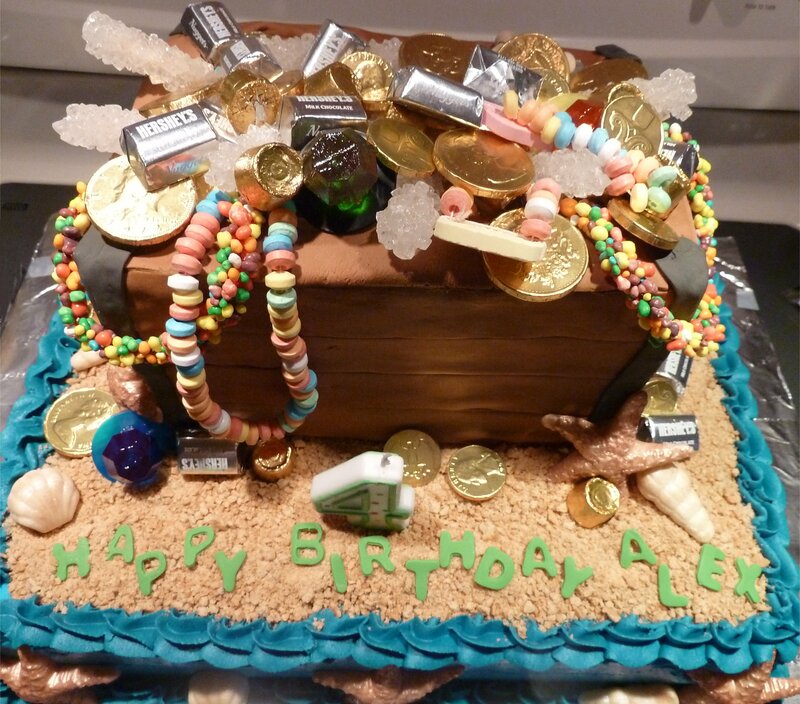 If only…..
Here’s a treasure chest a friend of mine made for a birthday party, and she’s not even a professional baker! Aren’t they incredible? So why not me….? Well, probably one main reason. No matter how hard I’ve tried, I just cannot frost a cake. No matter what I do there are always cake crumbs stuck in the icing. Really attractive! I’ve tried many times to make frosting flowers, and we won’t even discuss those fiascoes! And certainly I have no pictures! I have friends who turn out masterpieces from flour and sugar – and they’re just amateur bakers who should really open their own businesses. 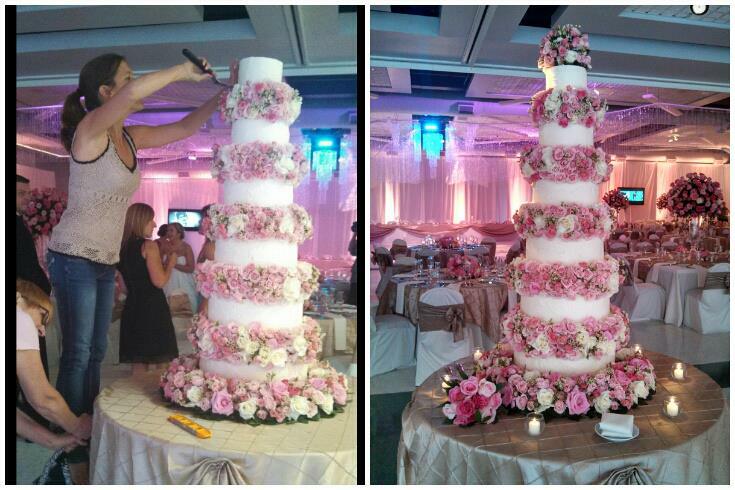 I have other friends who are professional bakers and create beautiful wedding cakes and birthday cakes. Like this magnificent creation from a collaboration between Jessica from Cake Delights and Catherine from Catherine’s Distinctive Floral Designs…layer after layer of gorgeous wedding cake with fresh roses in between each layer! So this frustrated baker gave up! Try as I might, there was never any question that whatever cake I made and decorated certainly involved no help from ANYONE else! But then…problem solved! With no oven or other cooking skills involved. It was perfect. All I needed was a set of towels or a package of diapers, and a couple of trips to the craft store. No ingredients to spoil. No pans or bowls to wash. No recipe to follow. Nothing to refrigerate! And I can even use actual cake pans to put the diaper cakes together! Best of all, I can do the decorating at my leisure; and if I don’t like the way it looks, all I have to do is unpin a few things and re-arrange them. 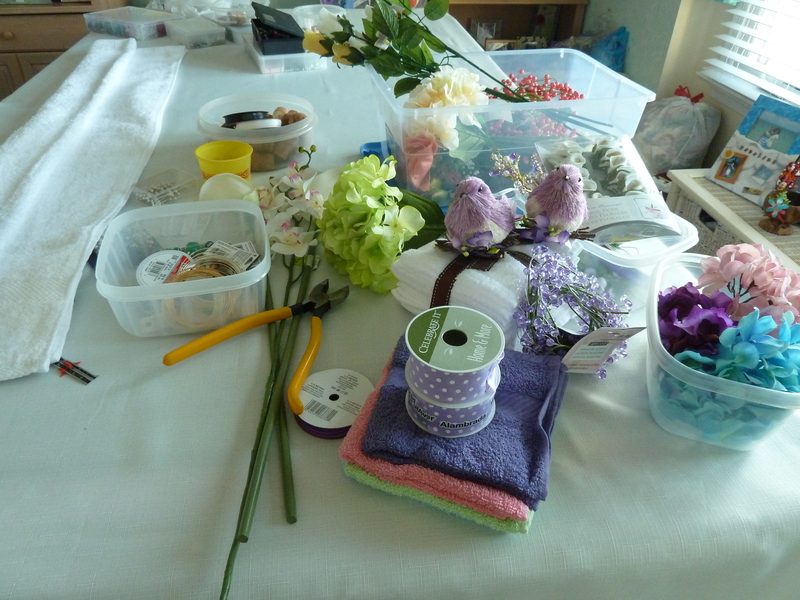 If I find items in the craft store I like, I can buy them and keep them on hand for future creations without worrying about them spoiling or going stale! So who wants a cake? Guaranteed it won’t be underbaked, burned on the bottom, and it can be kept around for a long time without it going bad! Want to hear something really funny? I actually received a postcard a few years ago from a local culinary school addressed to “Pastry Chef” at Cake-A-Bye Baby! I have it sitting on my desk! I’m deciding whether or not to frame it!